IFS Applications manages preventive and even predictive maintenance and ensures the required service work is performed. Maintenance Connection is a powerful CMMS product with comprehensive work order management capabilities. Planned, Preventative and Reactive Maintenance of complex assembly, individual components, and equipment in a production line can be effectively managed. This product is best suited for maintenance programs within Industrial Manufacturing, Healthcare, Facility Management, and Government organisations. It can be deployed as either an On-Premise or a Cloud-based product. The average price for a 3 user system, with 5 days of implementation and First Year’s support is about £10,000. The product can also be accessed via its Mobile App. Accruent’s vx Maintain is a cloud-based SaaS product. Mainly used for managing work orders and assigning jobs to your internal employees and external contractors. One of the best features of the product is the ability to create quick work orders with ‘just enough’ information. Top users of vx Maintain are from facilities management and retail sector. Tesco, Coop, John Lewis Partnership and Trevis Perkins are some of the well-known users of vx Maintain. Its starting price point is an annual fee of £60 per unit. Support Desk Pro is a service management solution with powerful computerised maintenance management capabilities. It is available as both a desktop application and a mobile CMMS app. The product takes a service-centric approach to maintenance management. The starting price point of this product is a monthly fee of £40 per user. It is payable monthly which is a cash flow and budget-friendly price plan. CASCADE CMMS software from DNV is a technical utility asset management software which is specifically designed to understand the condition of electrical assets, in such a way that you can base your maintenance plan based on the condition of your electrical utility assets. Globally, over 100 energy utilities use the CASCADE Computerised Maintenance Management Software for their technical asset management. The mobile module of CASCADE offers convenience to field-based staff. Maintenance Manager is a cloud based maintenance management solution. It is secure with 99.9% uptime. Also available as a Mobile App, it is designed to manage work orders, materials and fleet. The Maintenance Manager gives you complete clarity across your maintenance activities, helping you take impactful maintenance decisions. What is a CMMS Software? CMMS which means Computerised Maintenance Management System is a software which simplifies your planned, preventative and reactive maintenance activities. It offers a common tool for your office and field based teams to plan, execute and report on your maintenance activities. Plan your maintenance activities based on the condition of your assets and time intervals. Create work orders and job instructions aligned with the technical competency of your team. Collect data across all your maintenance activities to plan and schedule maintenance programs based on equipment information. Eliminate spreadsheet and paper based error prone culture which makes it very difficult to drive a result oriented maintenance program. Create a single source of truth for your planned, preventive, predictive and reactive maintenance. Provide mobile access of your CMMS program to your field based team in order to reduce the time and effort required to complete work orders. Improve uptime of your equipment by 4 to 11% to drive more profit per equipment. Reduce overall cost of maintenance by 6 to 22% by adopting preventative and predictive maintenance programs. Share maintenance data and intelligence from your maintenance programs to get business – technical consensus on maintenance budget allocation. Your organisation is likely to use your chosen CMMS software for 3 to 5 years (Calculated based on analysing average customer life of our 921 CMMS software buyers). So it really pays-off to invest time in choosing a system that will form the basis of your maintenance program. In the UK, there are 96 software vendors who provide equipment management and CMMS systems. As a result, it can be time consuming and confusing to look at multiple systems without having a clear idea of your requirements. The 15 points below have been written to clarify your thoughts and assist you in choosing the best CMMS system to meet your requirements. 1. Clarify your readiness to adopt a CMMS system and quantify your deliverables. Over 93% of new CMMS software buyers use spreadsheet and paper based methods before implementing a cloud-based CMMS system. Data entry, maintenance workflow and reporting are fundamentally different in a CMMS system. Moving away from the existing manual approach to a new system requires taking a fresh perspective to your maintenance program. There is no point in just replicating your current methods in a new CMMS system. For example; with a spreadsheet based system, most of the maintenance program is reactive or meter based. However, using a web-based CMMS tool will require you to switch to a preventative maintenance mode. Implementing a new CMMS system is best viewed as taking a new perspective to your maintenance culture and strategy. Leading maintenance teams assign maintenance oriented targets to be achieved with a new CMMS system. For example; if you have 500 equipment, your current maintenance cost is £200,000 and the average age of equipment is 4.5 years. With a new CMMS system, your maintenance cost should come down to the range of £160,000 to £180,000, and the average age per equipment should increase by 7 to 16%. Your 3 to 5 years’ maintenance goals should be aligned with your CMMS system. Ideally, they should be presented and agreed on by key people from the maintenance, production and financial teams. It is vital that you view your new CMMS system as a tool that helps you implement your maintenance strategy, as it is not the strategy itself. 2. Identify equipment and maintenance data that you would like to hold. The basis of a cost-saving and impactful maintenance program is concise and correct data. Too much data becomes overwhelming for technicians and users, while too little data creates ‘not enough information’ scenarios. Existing sources like accounting software, spreadsheet, and asset tracking systems can be a good source to import data into your CMMS system. If you have tagged your assets, then the best CMMS systems can easily read the equipment data. Work orders instruction, health and safety information, data about your office and field based teams, material, inventory and contractors are some of the vital areas that require identification before looking out for your best CMMS system. As you decide to switch from manual to digital work orders, establishing the type of your work order is a good starting point. If you are migrating from a spreadsheet based maintenance program, then your work order book is likely to look much different with a CMMS software. The level of planned, preventative and predictive maintenance will increase by at least 40 to 60%. Also, the level of information you can hold and analyse is substantially different with a CMMS system. For example; asset data, skillset data, resource availability, equipment condition, place of maintenance, health and safety information, and previous maintenance history can all be reviewed from your work order. Another element to think about here is who your work order creators are. It is not unusual for work order requests to be from end users of your equipment or facility in which case, you really require the work order fields to be simple and intuitive. There is a saying in the maintenance industry, “If you ask ten different maintenance engineers for the definition of planned maintenance, you will get ten different answers”. We suggest you work with the framework that works best for you. However, it is useful to be clear about your planned maintenance framework. This maintenance can be an inspection routine to decide on preventative maintenance tasks or it can be condition or interval based light maintenance activities. Preventative maintenance is a maintenance program for each of your equipment, and is based on time, interval, meter reading or regulatory compliance. For example; Changing the timing belt of your centrifugal pump every 12 months, after winter production run, after a reading of 60,000 cycle counts, or due to safety compliance will be examples of preventative maintenance program. In effect, preventative maintenance is derived from understanding data from mean time between failures. Below are some of the key elements that we suggest you investigate for your preventative maintenance program. Predictive maintenance is a maintenance program based on understanding the condition of the equipment using Vibration Analysis, Lubrication Analysis, Motor Circuit Analysis, Visual Inspections, Infrared Thermography, Ultrasonic Analysis and other advanced condition monitoring techniques. Manufacturer’s data, production runs, benchmarking industry maintenance plans and behaviour of the equipment are taken into account to understand the condition of your equipment. Predictive maintenance is an advanced maintenance program mostly relevant to production or operations critical assets. It is recommended to consider the suitability of predictive maintenance as it can have impactful changes to your maintenance, asset life and cost optimisation parameters. Even with a new CMMS software, you are very likely to undertake reactive maintenance tasks. Speed of response and quality of failure information are crucial elements in handling reactive situations. Typically, you will need to mobilise people and equipment. Quite often, temporary replacement equipment might be necessary. While you are deciding about your new CMMS software, it will be beneficial to know how you plan to deal with reactive situations and how your CMMS system can deal with it. In a reactive situation, a modern CMMS system will allow you to get an idea of the tools, people and instructions required to address reactive tasks. 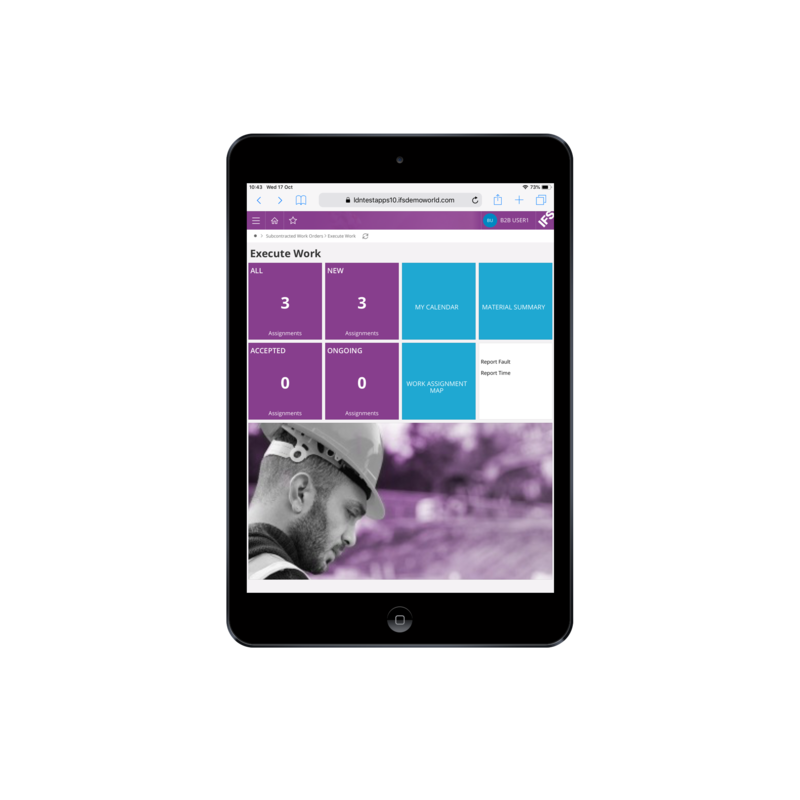 Whether you plan to rely on external maintenance contractors or your field based team, your mobile CMMS requirements must ideally be noted in detail. To start with, mobile hardware devices have access compromises. Tablets can be difficult to carry especially in space limited maintenance zones. These devices also have screen size limitations. While a web-based or cloud-based mobile CMMS solution is responsive (adjusts itself based on the type of device), flipping across multiple screens to find and input information requires consideration. From a definition viewpoint, service management is an agreed maintenance plan with your customer. Quite often, there tends to be a service level agreement with your customer. This management often involves light maintenance activities like inspection, oil change, consumables replacement and cleaning. The one area which makes this different from maintenance management is tracking vehicle/fleet status. However, this requirement can be address by most CMMS systems. Pro Info: Maintenance and Service Management are closely interlinked. They have significant overlap between their functions and the terms are sometimes interchangeably used. “Who is going to log your maintenance requests” is a very crucial topic for your CMMS selection (hence we are mentioning it twice). Quite often, service or breakdown requests are logged by end users of the product. It is vital to understand where and how the requests are going to be logged. Basically, there are 2 – 3 types of users who log the breakdown and failure requests. Mode of logging requests – email, maintenance portal, calls or help desk are important to note as they will help you in asking relevant questions and identifying the suitability of CMMS products as you see demos of different products. Another key element here is the requirements of your maintenance team on the roads, who are likely to require restocking of tools, flexible inventory delivery points, vehicle servicing, and access to a printer for work orders amongst other things. It is highly recommended to note these details as they will help you identify a CMMS tool that fits well in your maintenance workflows. One of the biggest benefits of moving from a manual spreadsheet based maintenance program to a CMMS system is the insight and maintenance intelligence that your system can develop. Quite often, reports are not viewed as part of the developing maintenance intelligence of your organisation. Pro Tip: Maintenance reports are useful to different parts of the organisation. Accounting can know about maintenance costs, production can know about downtimes and maintenance schedules and management can get to know about the overall maintenance budgets and costs. Make sure you collaborate with other departments as you refine your list of maintenance reports. Maintenance is a part of managing the complete life of your assets. There are activities linked to maintenance, such as initial capital planning, procurement, asset appreciation or depreciation and the final disposal. As you are planning to deploy a new CMMS software, it would be advantageous to take pre-maintenance and post-maintenance approaches to your maintenance. Total asset lifecycle management typically has considerable effect on Total Equipment Effectiveness and can therefore positively impact your maintenance program. You are likely to deploy a well-accepted CMMS system if you collaborate with different teams that benefit from your maintenance management initiatives. Despite the fact that every business is different, there are numerous areas which overlap between businesses within the same industry. Retail Maintenance Management Solutions require a special focus on managing different types of refrigerators. Facilities sector quite often use a combination of internal and external maintenance contractors. Maintenance systems in the manufacturing sector always require strong planning and scheduling features. The industry sector has special requirements and so does every business. By reviewing multiple CMMS systems from within your industry, you are likely to deploy a solution which aligns with your business and hence, is well used by your team members. Over the last 5 to 7 years, there has been a five-fold increase in the number of equipment which has advanced sensors and thermostats that can emit data about themselves. For example; a compressor can emit data about its operating conditions like temperature, pressure, meter readings, cycle counts and other elements. If you have, or plan to buy internet enabled equipment, then ensure that your new CMMS system is able to import and handle data emitted from different equipment. Equipment that emits data can help enormously with predictive and planned maintenance. In a lot of cases, they themselves will inform you about potential maintenance and failure issues. Pro tip: A cloud-based CMMS system is more adept at handling Internet of Things (IoT) enabled maintenance management program. There are CMMS systems that can develop patterns from historic maintenance plans, correlate with equipment performance, manufacturer’s data and industry benchmarks. All of this is possible using machine learning algorithms. As of now, most of these systems are applicable to capex heavy and asset intensive industries like Oil and Gas, Energy, Power, Aviation, Defense and Manufacturing. If you are looking for an advanced CMMS system, then it might be useful to investigate cognitive, machine learning or Industry 4.0 features. 1. How do I find the best CMMS software? The term ‘best CMMS software’ is subjective. What’s best for others may not be best for your situation. Just like the best car or best house for you is not the best for others. Only you can judge what the best CMMS tool for you is. Buying this software based on what others term as ‘Best’ is risky. Typically, a CMMS system stays in a business for 3 to 5 years, so it is ideal to find a solution that is best for you based on your requirements. In order to identify the best CMMS software for you, map out your technical, user level and commercial requirements and review software products that match your requirements. You can look through multiple CMMS product websites or use this CMMS search assistant to quickly identify the best options for you. 2. How much does a CMMS software cost? Based on our review of 96 UK based CMMS tools, the price ranges from £9.99 to £4250 per user per month. There are some really good systems available between £25 and £100 per user per month. Implementation costs will depend on your requirements. Chat with us if you would like to identify the best value CMMS tools for you. 3. Is a web-based or a cloud-based CMMS system better than an On-Premise tool? This depends on your requirements. There are certain industries and instances where a web or a cloud based solution can have access limitations. There are also instances where your company may prefer to restrict web-access for cyber security reasons. In some instances, companies do not prefer their data to be on the web. All these conditions favor an on-premise solution. Ownership Model You own the software You rent the software and the space where you hold your data. To be clear, you just own your own data. 4. What is the difference between Mobile CMMS, CMMS App and CMMS Software? CMMS software is an application that you can access from a desktop, laptop and mobile. Most web-based software are responsive, which means their window will adjust to the type of device you are accessing the product on. Mobile CMMS is that which you can access on your phone’s browser. CMMS App is an application that you can download from App. Store or Google Play and access on your phone. The app can be really useful in accessing information without internet connection. 5. Should small businesses invest in CMMS software? If you own more than £500,000 in assets or have more than 250 assets then a CMMS tool will be useful. The general rule of thumb is that you save about 4 to 18% on your maintenance costs with a CMMS tool. Therefore, for assets worth £500,000, you are likely to save £20,000 to £90,000 across the life of your assets with a CMMS tool. There are instances where you will be better off to source an external contractor to manage all your maintenance management requirements. 6. How does Comparesoft (this website) compare CMMS software? Comparesoft relies on maintenance experts, natural language processing and machine learning to identify and match CMMS products to your requirements. In essence, we blend human experience and artificial intelligence to identify the best products based on your requirements. We have asked every CMMS software vendor listed on our website to demo their product to us. Product strengths and differentiators have been verified. 7. Why should I use Comparesoft to compare and shortlist CMMS products? You can identify the products that match your requirements within a few minutes by answering some fundamental maintenance oriented questions. Communicate with multiple vendors from one single place. CMMS Software buying is complex and hard. Most tools look the same, feel the same and nobody has bad reviews. We have done the hardwork of identifying cost effective and value based tools. Products like IBM Maximo, IFS, FMIS, Ultimo and 94 other products are listed with us. We will recommend to you the products which are right you. Software Buyers from Volvo, PwC, Transport for London, GE, Siemens, NHS, Honda, BAE Systems, Just Eat and 16000+ other big and small businesses from different industries have used our UK based comparison service. 8. Should I buy CMMS software based on Reviews? Genuine Reviews are very useful and can aid in your decision making. However, the challenge is finding genuine and complete reviews. The web is full of fake and paid reviews which makes it difficult to identify useful information. We genuinely struggle to see bad reviews about software products which makes the reviews opaque.